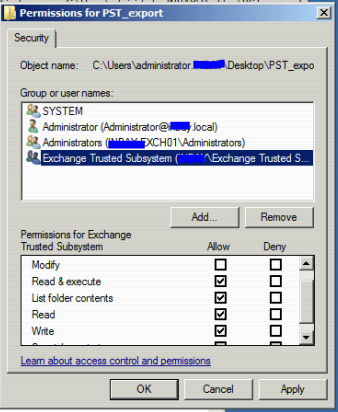 Remember the Export-Mailbox command on exchange 2007??? The main problem I personally had was the annoying outlook requirement. With the exchange server 2010 service pack 1 release, M$ introduced a new Cmdlet to export mailboxes on the server. And it does not require outlook. Exporting Mailbox Items with "New-MailboxExportRequest"
Start the process of exporting a mailbox or personal archive to a .pst file. You can create more than one export request per mailbox. Each request must have a unique name. Change export request options after the request is created or recover from a failed request. Suspend an export request any time after the request is created but before the request reaches the status of Completed. Resume an export request that’s suspended or failed. Remove fully or partially completed export requests. Completed export requests aren’t automatically cleared. You must use this cmdlet to remove them. The AcceptLargeDataLoss parameter specifies that a large amount of data loss is acceptable if the BadItemLimit is set to 51 or higher. Items are considered corrupted if the item can't be read from the source database or can't be written to the target database. Corrupted items won't be available in the destination mailbox or .pst file. The BadItemLimit parameter specifies the number of bad items to skip if the request encounters corruption in the mailbox. Use 0 to not skip bad items. The valid input range for this parameter is from 0 through 2147483647. The default value is 0. If you want to export the user’s online archive to .pst, use the –IsArchive parameter. People do crazy stuff scripting with this Cmdlet. Look around in the interwebs for some scripts.